Montgomery County, TN – The annual Montgomery County Volunteer Fire Service Awards Dinner was held Friday, November 2nd at the William O. Beach Civic Hall. Congratulations to the award recipients: Liza Kurt, Rescue Squad; Jason Smith, Palmyra station; Shaun Arms, Cunningham station; Thomas Higgins, St. Bethlehem station; Jamie Sensing, East Montgomery station; and John Bateman, Woodlawn station, for all being selected as Firefighters of the Year for their respective stations. Shaun Arms was given the high honor of being selected as the Overall Firefighter of the Year for 2012. Shaun has been a volunteer firefighter since 2006 and currently serves with the Cunningham Volunteer Fire Service. 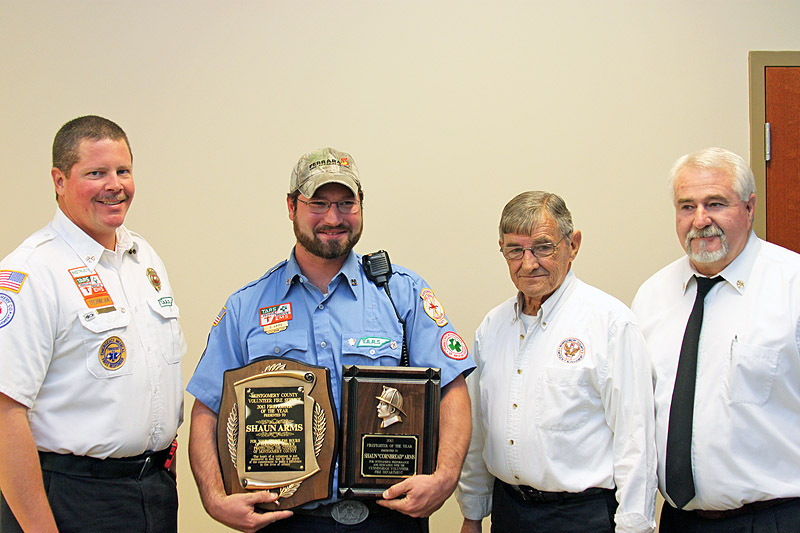 (L to R) Wade Kunstmann, Assistant Chief for the Cunningham Volunteer Fire Department; Shaun Arms, Overall 2012 Firefighter of the Year; Jerry Buchanan, Montgomery County Fire Chief; and Ed Baggett, Assistant Montgomery County Fire Chief.